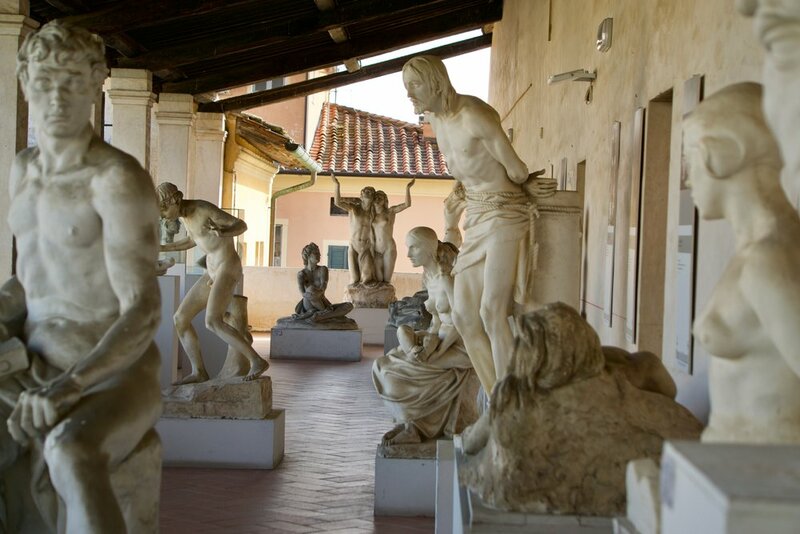 Pietrasanta was an amazing experience. It's a small, very manageable town with lovely things to walk around and look at. There are many charming outdoor dining opportunities and very few tourists. In fact, there was not one other person besides my friends that I recognized as being American tourists. In the early evening the restaurants begin to set up in the street, locals are walking their dogs and shop girls are waiting for diners to visit their stores. Savonn our yogi extraordinaire and leader of our trip lead the way. When we arrived she helped us get our bearings and we located the restaurant we would meet at later in the evening. This way we could all explore. We started together and then broke off into our own journeys. Our first spot we visited was the square which had it's annual sculpture event in front of the sculpture museum. The museum is located in an old Catholic Church and really quite amazing. The wear and tear and well aged structure is absolutely breathtaking with a classic old Italian patina, in the church is more modern paintings and sculpture. The juxtaposition is sublime. Apparently there is a yoga theme all over Tuscany! Loved this happy dancing sculpture! Sitting atop the marble steps leading into the sculpture museum church is this beauty. Lisa takes in this magnificent site...and sight. A modern marble sculpture of a mother nursing her baby surrounded by antique paintings of Madonna and her baby really captures you. My dinner companions minus one after an amazing Italian dinner at Pinocchios.